Faced with a unique lot size of 20 by 200 feet, Canadian design studio Randy Bens Architect was challenged to create a home with a sense of expansiveness despite the property’s back lane-like dimensions. 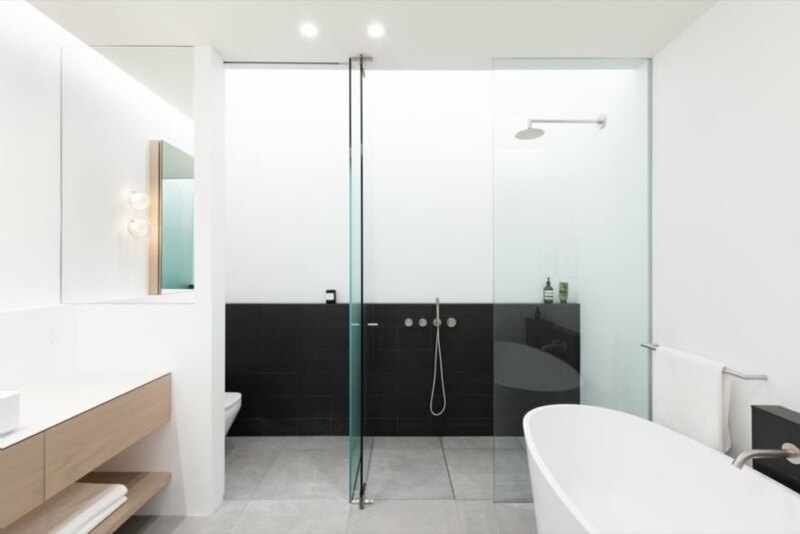 Tapped by boutique builder Moosehead Contracting, the architects teamed up with Falken Reynolds Interiors to complete the Saint George House, a project that proves that beautiful and innovative design is possible even on challenging sites. 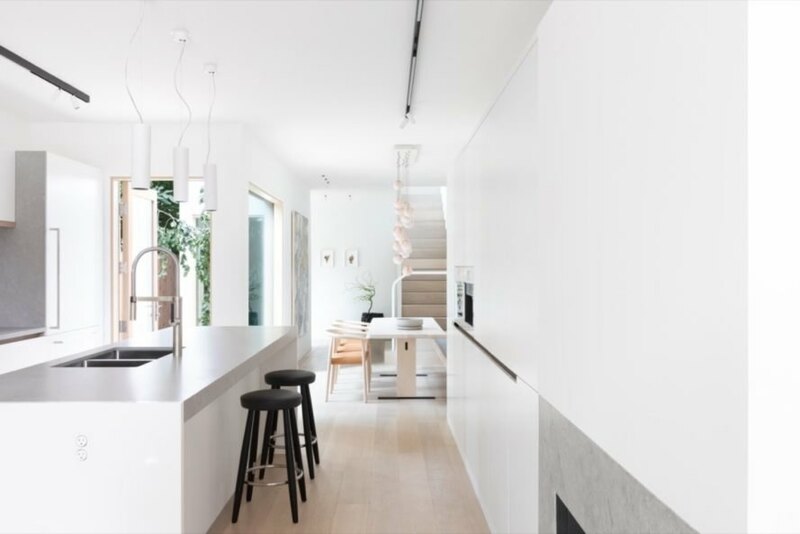 Interested buyers and design lovers will get the chance to tour the modern home next month during Vancouver’s Interior Design Show. Spanning an area of 2,200 square feet, the Saint George House is split into two volumes, both of which are clad in standing-seam metal and topped with a slanted roof. The lower level houses an open-plan living room, dining area and kitchen and also spills out to a sunny deck with ample entertaining space through massive sliding glass doors. The larger upper volume cantilevers over the deck and contains the private areas, including three bedrooms. Bringing natural light indoors was key to making the home feel spacious, as was the minimalist, Scandinavian-inspired palette of white walls and light-colored timber. 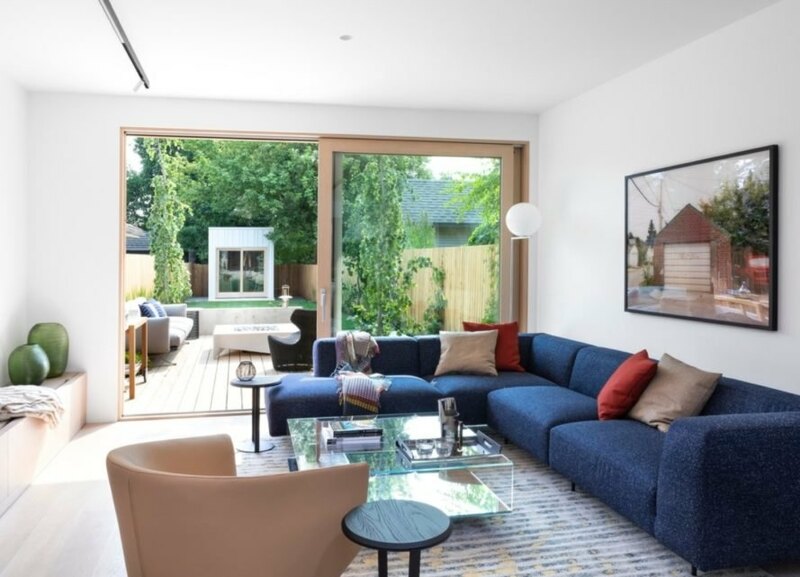 Boasting a style that Falken Reynolds Interiors calls “Canadian Nordic,” the bright and airy home is furnished with Bocci lighting, Corian Solid Surface and Quartz, and Bensen furniture with exclusive Raf Simons fabrics. Pops of color, warm textures and connection with the outdoors help establish the home’s cozy character. 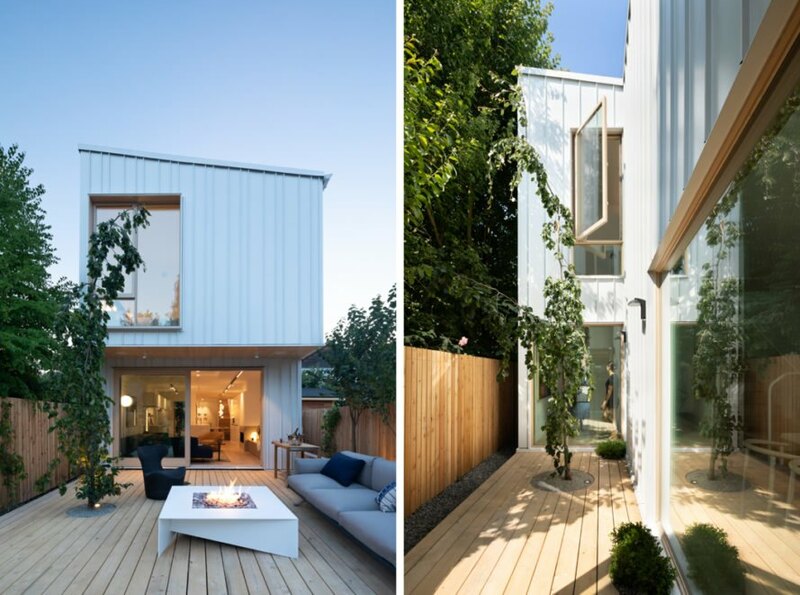 Randy Bens Architect managed to fill this narrow home with light using innovative design. A large glass door opens up to the patio and garden beyond. Natural light and white walls help make the interior feel spacious. The skylight at the top landing of the stairs brings light into the home. 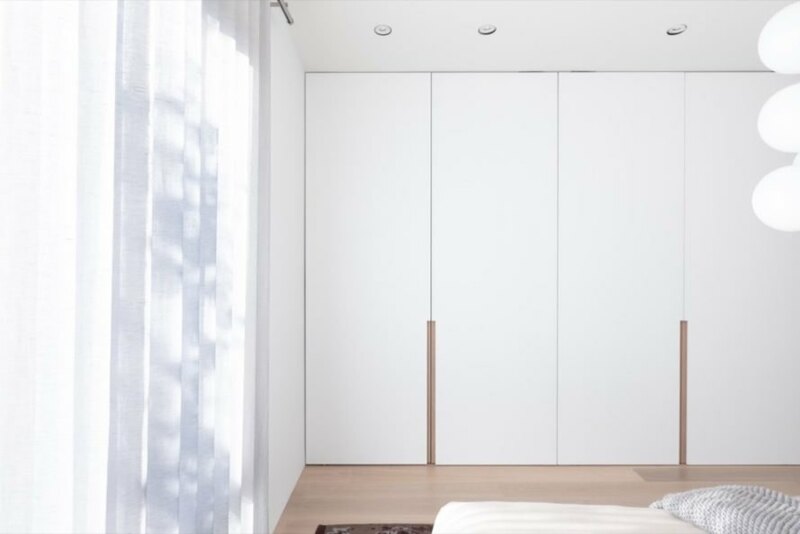 The master bedroom features pivot hinged closet doors with integrated oak finger pull reveals. 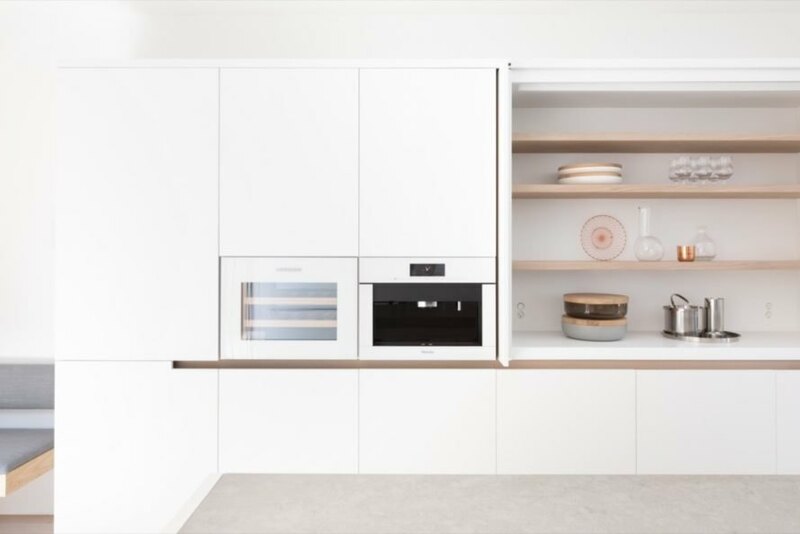 White lacquer millwork is complemented with Corian Solid Surface counters. The interior design is stunning throughout. Here's a look inside one of the upstairs bathrooms. Standing seam metal clads the exterior.